Objectives To identify patterns in euthanasia requests and practices relating to psychiatric patients; to generate recommendations for future research. Design Retrospective analysis of data obtained through medical file review. Setting Outpatient psychiatric clinical setting in the Dutch-speaking region of Belgium, between October 2007 and December 2011; follow-up at the end of December 2012. Participants 100 consecutive psychiatric patients requesting euthanasia based on psychological suffering associated with psychiatric disorders (77 women, 23 men; mean age 47 years; age range 21–80 years). Main outcome measures Patient sociodemographic characteristics; diagnoses; decisions on euthanasia requests; circumstances of euthanasia procedures; patient outcomes at follow-up. Results Most patients had been referred for psychiatric counselling by their physician (n=55) or by LEIF (Life End Information Forum) (n=36). 90 patients had >1 disorder; the most frequent diagnoses were depression (n=58) and personality disorder (n=50). 38 patients required further testing and/or treatment, including 13 specifically tested for autism spectrum disorder (ASD); 12 received an ASD diagnosis (all Asperger syndrome). In total, 48 of the euthanasia requests were accepted and 35 were carried out. Of the 13 remaining patients whose requests were accepted, 8 postponed or cancelled the procedure, because simply having this option gave them enough peace of mind to continue living. In December 2012, 43 patients had died, including 35 by euthanasia; others died by suicide (6), palliative sedation (1) and anorexia nervosa (1). Conclusions Depression and personality disorders are the most common diagnoses in psychiatric patients requesting euthanasia, with Asperger syndrome representing a neglected disease burden. Further research is needed, especially prospective quantitative and qualitative studies, to obtain a better understanding of patients with psychiatric disorders who request euthanasia due to unbearable psychological suffering. This is the first report on a relatively large (n=100) series of requests for euthanasia exclusively from patients whose requests are based on unbearable and untreatable psychological suffering due to a psychiatric illness. This retrospective case note review draws attention to and deepens our understanding of the circumstances of a small but severely afflicted subgroup of psychiatric patients. Selection bias was minimised by the inclusion of all consecutive cases that met the selection criteria within a specified time frame. Owing to the retrospective study design, some potentially important determinants, such as personal and social background and the details of the psychiatric evaluation, were not systematically collected. The sample size limited the generalisability of the findings and the scope for detecting statistically meaningful differences based on determinants that may be associated with a euthanasia request being granted, refused or withdrawn. The Belgian Euthanasia Law (2002) defines euthanasia as the physician's “act of deliberately ending a patient's life at the latter's request,” by administering life-ending drugs.1 In Europe, psychological suffering stemming from either a somatic or mental disorder is acknowledged as a valid legal basis for euthanasia only in Belgium, the Netherlands and Luxembourg.2 In the Netherlands and Luxembourg, the term ‘assisted suicide’ is used when the life-ending drugs are taken orally, but in Belgium, the term ‘euthanasia’ is used whether the drugs are received orally or intravenously. Euthanasia for patients with unbearable somatic suffering is the subject of fierce ethical debate, and the debate is even fiercer in cases of unbearable psychiatric suffering. Since legalisation of euthanasia in Belgium in 2002, the number of euthanasia deaths reported by the FCEC has increased each year, rising from 742 in 2004/2005 (including 9 (1.2%) with neuropsychiatric disorders)12 to 2086 in 2010/2011 (including 58 (2.8%) with neuropsychiatric disorders).13 ,14 (The year 2004/2005 was the first year that neuropsychiatric disorders were specified in the FCEC data). This rise over a 6-year period may reflect a true increase or better reporting of cases of euthanasia.5 Proportionally, no differences with regard to gender, age, diagnoses or the nature of the patients’ suffering were observed over these years. Between 2008 and 2011, for a total of 3612 euthanasia deaths, the FCEC reported a male-to-female ratio of 51:49, and 2% of these deaths involved patients aged 20–39 years, 21.5% were aged 40–59 years, 51.5% were aged 60–79 years and 25% were 80 years or older.13 ,14 Overall, 45% of the patients died in a hospital, 45% at home and 10% elsewhere.13 ,14 The barbiturate, sodium thiopental, was the life-ending drug used in the vast majority of cases.13 ,14 Over 91% of these patients were terminally ill, while 8.5% suffered from a non-terminal condition. The overall objectives of this study are: first, to report on characteristics of psychiatric patients requesting euthanasia because of psychological suffering; and second, to describe the formal assessment procedures and outcomes of the euthanasia requests. To the best of our knowledge, this is the first study to explore the determinants, procedures and outcomes of euthanasia requests in a relatively large group of psychiatric patients with psychological suffering. This paper describes a retrospective case note review of the first 100 consecutive patients who requested euthanasia for psychological suffering associated with psychiatric disorders between October 2007 and December 2011. All consecutive cases were selected from among patients at an outpatient psychiatric clinical setting in the Dutch-speaking region of Belgium, where the first author and psychiatrist (LT) works, with intake beginning after LT completed LEIF (Life End Information Forum) training in March 2007 (the first case was in October of that year) and ending in December 2011 (ie, when LT joined ULTEAM—a newly founded central institute in Belgium to manage end-of-life cases—and thus stopped managing new requests for euthanasia at her private practice). Since 2012, no new follow-up studies were performed as this would have required a new study protocol and IRB request. The data analysis was closed at the end of 2012, and the data analysis and writing were conducted in 2013/2014. All patient information had been recorded in full in the patient files, providing a clear database of information for analysis and follow-up. Sociodemographic data (age, gender, employment and living circumstances) and diagnoses were analysed. Decisions on euthanasia requests (including referrals for further testing/treatment), number of consultations, circumstances of euthanasia procedures and patient outcomes, were also analysed. By including all consecutive cases that met the selection criteria within a specified time frame, selection bias was minimised. The psychiatric diagnoses were made according to the Diagnostic and Statistical Manual of Mental Disorders, 4th Edition (DSM-IV) classification. LT was involved in the counselling, referring and evaluation of all patients, as a consultant physician. At the end of 2012, all 100 patients or their practitioners were contacted to establish whether the patients were still alive and, if not, how they had died. This study was a retrospective, non-interventional medical record analysis study of 100 patients requesting euthanasia in the context of psychological suffering. Given the nature of the study, the Ethics Committee confirmed that obtaining informed consent from the patients included in the study was not required on condition that the medical records were coded and made anonymous. To translate the Euthanasia Law into clinical practice in Belgium, the psychiatrists and/or LEIF practitioners among the authors (LT, WD, KA and PPDD) developed a four-track approach based on the guidelines of the Dutch Psychiatric Association (NVvP),7 which were issued in 2004 and revised in 2009, and also adapted to the requirements of the Belgian Euthanasia Law. LEIF, established in 2003 in Belgium, is a service that refers people to qualified healthcare professionals for assistance with end-of-life matters, and also offers training programmes for physicians.4 ,15 The NVvP guidelines are the first on this subject and are written in the same language used in the Dutch-speaking region of Belgium; therefore, they serve as a practical and valid basis for the application of the Belgian Euthanasia Law in the context of this study. For all patients in the sample, the four-track approach has been used. Further details about this approach are being prepared for publication separately. There must be a thorough evaluation through multiple consultations regarding the specific determinants and conditions of ‘unbearable and untreatable psychological suffering’ in each case. LT ascertained the psychiatric diagnoses, mental state and history of each patient after consultation with the treating practitioner(s), and made a thorough review of the case file and full psychiatric evaluation of the patient. All procedural aspects should be explained to, and discussed with, the patient. Only when the patient repeatedly expresses the wish to die, and the patient's physician or psychiatrist indicates that the patient's reasons for this wish are sufficiently tangible and reasonable, will the formal request for euthanasia be filed and the planning begin.7 According to the Law, at least 1 month must elapse between the written request (which will be kept on file by the patient's practitioner) and the implementation of euthanasia. The patient's family and/or significant others should be involved. Legally, the physician is required to discuss the wishes of the patient with the relatives named by the patient. Consent from the relatives is not required, and the attending physician needs the patient's permission to inform family members of the euthanasia request.1 ,3 Fostering acceptance in the patient's social environment can give the patient the opportunity to pass away in a serene atmosphere, surrounded by family and/or friends, whose mourning process can thus also be softened. One hundred consecutive psychiatric patients requesting euthanasia based on psychological suffering associated with psychiatric disorders during the study period were included. The patients included 23 men and 77 women, age ranging 21–80 years, with an average age at intake of 47±13 years (mean±SD); the average was 46±16 years for men (range 22–79 years) and 47±12 years for women (range 21–80 years). The age–gender distribution is shown in figure 1. The majority (n=81) had been professionally inactive for an extended period of time, including 8 who were retired and 73 who were medically unfit for work (they were either receiving disability living allowances or had taken early retirement). Fourteen patients were still working or temporarily on sick leave. One patient was a student, one was imprisoned and one was receiving a subsistence income from the Public Social Welfare Agency (data on income/employment were not available for two patients). Fifty-nine patients were living alone while 41 were living with one or more companions. Frequency of age in 100 psychiatric patients who requested euthanasia, by gender. The 100 patients included in the study were referred for psychiatric counselling by LEIF (n=36), their general practitioners (n=21), their consulting psychiatrists (n=24), their consulting psychotherapists (n=10) or otherwise (n=9). At the time of the intake consultation with LT, each patient had at least one diagnosis that had been given by his or her practitioner, which was subsequently confirmed by LT (see track 1 in Methods section). Ninety of the 100 patients had more than one diagnosis. Most patients presented with numerous diagnoses, but for the sake of clarity, we report only a maximum of three disorders per patient, taking only the most recent diagnoses for each. Most of the patients suffered from a treatment-resistant mood disorder (n=58, including 48 with major depressive disorder and 10 with bipolar disorder) and/or a personality disorder (n=50), while 29 patients had both. Other psychiatric diagnoses included post-traumatic stress disorder (n=13), schizophrenia and other psychotic disorders (n=14), anxiety disorders (n=11), eating disorders (n=10), substance use disorders (n=10), somatoform disorders (n=9), pervasive developmental disorders (n=8; including 7 with Asperger syndrome—an autism spectrum disorder (ASD)—and 1 with attention deficit hyperactivity disorder), obsessive–compulsive disorders (n=7), dissociative disorders (n=7) and complicated grief (n=6), among others. In addition to their psychiatric disorder(s), 23 patients also had somatic illnesses, including chronic fatigue syndrome and/or fibromyalgia (n=8), or other chronic somatic suffering (n=15). The 50 patients with personality disorders included borderline personality disorder (27), dependent personality disorder (3), histrionic personality disorder (2), avoidant personality disorder (1), narcissistic personality disorder (1), paranoid personality disorder (1), cluster B personality disorder (1) and personality disorders not otherwise specified (14). In all patients, the suffering was chronic, constant and unbearable, without prospect of improvement, due to treatment resistance. After initial evaluation, and discussions with each patient and his or her practitioner(s) about all therapeutic options that could alleviate suffering, as required by the Euthanasia Law (see tracks 1 and 2 in Methods section), 38 patients were referred for further diagnostic tests and/or treatment to specialised inpatient (n=17) or outpatient (n=21) care facilities. Thirteen of those 38 patients were specifically tested for ASD, and among them 12 received an ASD diagnosis (all were Asperger syndrome). After the further testing/treatment, 17 of these 38 requests for euthanasia were accepted (44.7%) and 10 were carried out. The other 62 patients were not referred for further testing or treatment because of the clear absence of reasonable therapeutic alternatives for them, as described in the NVvP guidelines. Thirty-one of these 62 patients had their requests for euthanasia accepted (50%) and 25 were carried out. In total, 48 of the 100 patients’ euthanasia requests were accepted (48%), because LT (psychiatrist), in discussion with the patients’ other practitioners and families, considered the requests to be based on reasons that were sufficiently tangible and reasonable, and because all legal requirements had been fulfilled. Among all 48 patients whose euthanasia requests were accepted, euthanasia was performed in 35 patients (72.9%), while two committed suicide before the procedure could be implemented and 11 patients decided to either postpone or cancel the euthanasia procedure. Of the latter 11 patients, 8 explained (by phone or mail) that knowing they had the option to proceed with euthanasia gave them sufficient peace of mind to continue their lives, while 2 withdrew their euthanasia requests due to strong family resistance and 1 could not be implemented on the grounds that the patient was imprisoned. Among the 52 patients whose requests were not accepted, 38 withdrew their requests before a decision was reached, while another 8 continued to pursue their requests, 4 committed suicide and 2 died spontaneously. By the end of 2012, when follow-up was conducted, 43 of the 100 patients had died. Euthanasia had been performed on 35 patients (9 men and 26 women). Six patients had committed suicide (2 men and 4 women). Two other female patients had died, one after palliative sedation in a psychiatric hospital, and the other due to the terminal stage of anorexia nervosa. In the six suicide cases, one (woman, aged 51) found the procedure for obtaining the approval for euthanasia to be unbearably long, one (woman, 74) found the waiting time after the approval unbearably long, and one (woman, 42) committed suicide because her family resisted the option of euthanasia, even though the request had been approved. Two patients (both men, 33 and 44) committed suicide after breaking off communication (after requesting euthanasia), and one (woman, 55) committed suicide after staying in a psychiatric ward to which she had been referred. In the remaining 57 cases (12 men and 45 women), the patients or their practitioners were contacted and it was confirmed that these patients were still alive. In nine cases their requests were still in process and no decision had been reached. In 48 cases, their requests were on hold because they were managing with regular, occasional or no therapy. Not including an extended history of previous therapy sessions with their respective practitioners, among the 35 patients who underwent euthanasia, the average number of psychiatric counselling sessions with LT following the request for euthanasia was 3.49±4.42 (mean±SD) per patient. The average time between making the request for euthanasia (ie, the first session with LT) and performing the euthanasia procedure was 8.66±9.55 months (mean±SD). Among the 35 patients who received euthanasia, in 20 cases, the procedure was performed by the patient's general practitioner, in 1 case it was performed by her neurologist and in the other 14 cases the procedure was performed by an LEIF physician consulted for the case. The barbiturate, sodium thiopental, was used as the main life-ending drug in all 35 euthanasia procedures (31 intravenously, 4 orally). In 28 cases, the procedure took place in domestic surroundings, while 5 took place in the neurology ward of a university hospital, 1 took place in the office of the consulting physician and 1 at the palliative care ward of a general hospital. Thirty of the 35 patients had family and/or friends present at the time of death. In 33 of the 35 procedures, the relatives and the doctors performing euthanasia explicitly reported a calm and smooth passing. In one case, tensions rose due to emotional difficulties for some relatives in fully accepting the patient's wish to die by means of the euthanasia procedure. In another case, the practitioner performing the procedure was inexperienced and became overwhelmed and stressed by the situation, which caused discomfort for the patient. Among 100 patients requesting euthanasia based on psychological suffering associated with psychiatric disorders, most had been referred for psychiatric counselling by their own practitioner (n=55) or by LEIF (n=36). Ninety patients had more than one psychiatric disorder at intake; the most frequent diagnoses were depression (n=58) and personality disorder (n=50); 29 patients had both. Thirty-eight patients were referred for further testing and/or treatment. In total, 48 of the euthanasia requests were accepted and 35 were carried out. Among the other 13 patients whose requests were approved, 2 committed suicide before the procedure could be carried out and 11 patients decided to postpone or cancel the procedure (including 8 who said that knowing they had the option to proceed with euthanasia gave them sufficient peace of mind to continue their lives). Overall, 43 patients had died by the time follow-up was conducted by LT at the end of December 2012: 35 had died by euthanasia, 6 by suicide, 1 after palliative sedation and 1 from anorexia nervosa. Nevertheless, this study has inherent limitations. Some potentially important determinants, such as personal and social background and the details of the psychiatric evaluation, were collected as part of the clinical file but not in a systematic way, as would have been applied in a prospective study. The sample size may have limited the ability to detect statistically meaningful differences based on determinants that may be associated with a euthanasia request being granted, refused or withdrawn. By including all consecutive cases that met the selection criteria within a specified time frame, selection bias was minimised. It is not possible to estimate how representative this sample is of the entire population of similar patients. Comparing characteristics and outcomes of our sample with the national data is not helpful since the FCEC only reports data from patients who died by euthanasia, not from patients who requested euthanasia. Moreover, FCEC does not differentiate between specific determinants of patients suffering predominantly from neurological and psychiatric disorders. Similarly, it is impossible to assess to what extent the findings are generalisable to other groups of similar patients; a larger sample would have strengthened the study in this regard. In comparison to other studies, our patient group contains more women than men (23 men and 77 women), which is different from the male-to-female ratio in the euthanasia cases carried out for somatic and/or mental reasons as recorded by the FCEC (51:49). This is in line with other reports in the literature, which indicate that women fulfil the diagnostic criteria for mental disorders more often than men, except in the case of substance use disorders.18 Furthermore, demand for mental healthcare19 and utilisation of mental healthcare services20 are higher in women than in men. 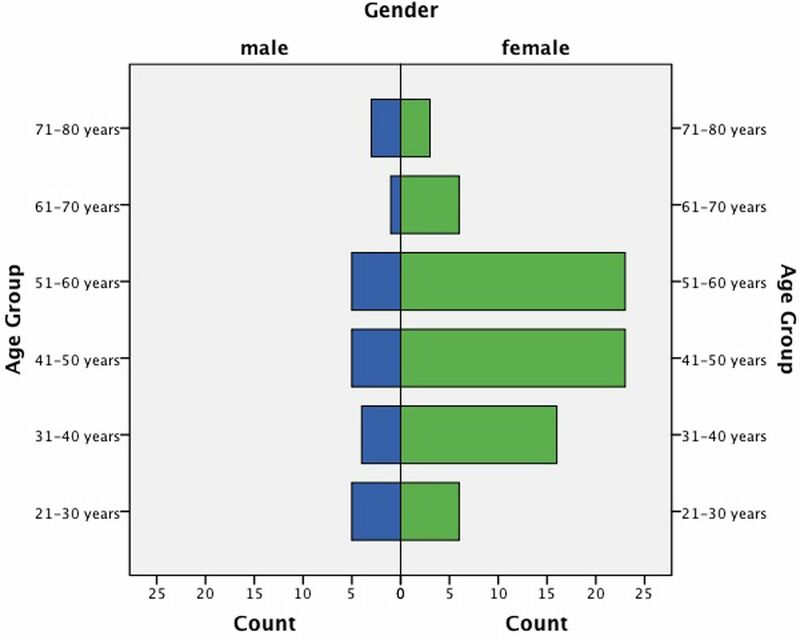 When compared with the FCEC data, our group of psychiatric patients requested to end their lives at a younger age (median=47 years) than the overall group of patients who have undergone euthanasia for any reason (ie, somatic and/or mental reasons combined), the majority of whom have been older than 60 years. This may be partly explained by the earlier onset and longer course of psychiatric disorders (eg, treatment-resistant mood disorder) compared to the somatic disorders that are usually the basis of euthanasia requests (eg, cancer). It may also be a reflection of the complex nature of psychiatric disorders, which have a sense of hopelessness as a core symptom. Furthermore, the complexity of psychiatric disorders might have led to the initial underdiagnosis of Asperger syndrome in our patient group, the analysis of which is beyond the scope of this report. At intake, patients already had an ASD diagnosis, and 12 more patients (who had further testing/treatment after requesting euthanasia) were diagnosed by dedicated diagnostic work up. All 19 of these patients had Asperger syndrome, with normal to high IQ. Among the 35 patients in this study who died by euthanasia, 28 died in domestic surroundings and 7 in a clinical setting. Thirty of these patients died with family and/or friends present, in a serene and positive atmosphere, which would have been impossible to attain in the case of unassisted, traumatic suicide. Patients and relatives report their experience of euthanasia as a more humane death than suicide, and they expect a less difficult period of mourning. Bereavement after the suicide of a relative or significant other entails an emotional turmoil that may last a long time, and, in some cases, may end with the mourner's own suicide.21 Accordingly, we note that the fact that their euthanasia request was being considered could not prevent suicide in 6 patients, including 2 of the 48 patients (4.2%) whose euthanasia requests had been approved and 4 of the 52 patients (7.7%) whose requests had not yet been approved. Moreover, the modes of suicide were dramatic, but we cannot provide further details due to respect for patient confidentiality. It is a difficult tightrope to tread: on the one hand, there must be sufficient time to accomplish all legal and medical requirements, on the other, there is a need to take action before the suffering reaches an unbearable level and leads to traumatic suicide. Likewise, a clear distinction should be made between suicidality (in thoughts and behaviour), which is symptomatic of (and/or triggered by) a number of psychiatric disorders, and a well-considered euthanasia request, which includes a patient's statement that his or her suffering is entirely unbearable, and that available treatment and medical assistance has been found to be inadequate. Therefore, we wish to underline that each euthanasia request must be scrutinised as a request for effective and far-reaching treatment, and that any such request demands exploration of all implications and clarification of alternatives. The four-track approach implies that patients are compos mentis—that is, they can make a rational choice; under the Euthanasia Law it is required that patients are legally competent and so their capacity for discernment is thoroughly assessed before any request for euthanasia is considered. A literature review made clear that the concept of ‘unbearable suffering’ has not yet been defined adequately, and that views on this concept are in a state of flux.22 It is generally accepted that this concept is considered to be subjective, dependent on personal values, and that it must be determined in the first place by the patient.6 Nevertheless, a psychiatrist should carefully evaluate this in the context of each patient's psychopathology.6 Unfortunately, there are no guidelines for the management of euthanasia requests on grounds of mental suffering in Belgium. Taking into account the ongoing fierce ethical debates, it is essential to develop such guidelines, and translate them into clear and detailed protocols that can be applied in practice. Therefore, further studies are recommended, especially prospective quantitative and qualitative studies, to obtain a better understanding of patients with psychiatric disorders who request euthanasia due to unbearable psychological suffering. Furthermore, these studies could undertake systematic comparisons between groups of psychiatric and non-psychiatric patients, thereby exploring the risk factors for, and origins and degree of, unbearable suffering in both patient groups. The authors wish to thank Dr Marleen Temmerman for her critical input and comments, and her encouragement for us to publish this work. They also wish to acknowledge the valuable language and technical editing by Jane Patten, of Green Ink, UK. Ministry of Justice. Law on euthanasia of May 28, 2002. Brussels: Belgian Official Gazette, 2002. http://www.npzl.be/files/107a_B3_Wet_euthanasie.pdf (in Dutch and French).
. Legal aspects of care at the end of life. Antwerp: Intersentia, 2012 (in Dutch).
. Guideline dealing with the request for assisted suicide by patients with a psychiatric disorder. Utrecht: Dutch Psychiatric Association. De Tijdsstroom, 2009. http://steungroeppsychiaters.nl/wp-content/uploads/Richtlijn-hulp-bij-zelfdoding_NVvP-2009.pdf (in Dutch).
. (2012). The normative context of the Dutch Euthanasia law. Nijmegen: Wolf legal Publishers, 2006 (in Dutch).
. Euthanasia and law in Europe. Oxford, UK; Portland (OR): Hart Publishing, 2008. Ministry of Justice. Law amending the Law on Euthanasia of May 2002 in order to allow euthanasia for minors. Brussels: Belgian Official Gazette, 2014. http://www.ejustice.just.fgov.be/doc/rech_n.htm (in Dutch). Federal Control and Evaluation Committee on Euthanasia. Second report to the Parliament (2004–2005). Brussels: Federal Control and Evaluation Committee on Euthanasia, 2006. http://www.dekamer.be/FLWB/PDF/51/2733/51K2733001.pdf (in Dutch). Federal Control and Evaluation Committee on Euthanasia. Fourth report to the Parliament (2008–2009). Brussels: Federal Control and Evaluation Committee on Euthanasia, 2010. http://www.ieb-eib.org/nl/pdf/rapport-euthanasie-2010-belgique-nl.pdf (in Dutch). Federal Control and Evaluation Committee on Euthanasia. Fifth report to the Parliament (2010–2011). Brussels: Federal Control and Evaluation Committee on Euthanasia, 2012. http://www.senate.be/www/webdriver?MItabObj=pdf&MIcolObj=pdf&MInamObj=pdfid&MItypeObj=application/pdf&MIvalObj=83889004 (in Dutch and French).
. Life End Information Forum (LEIF): professional advice and support at end-of-life issues. Psychooncology 2008;17:S222.
. Do men consult less than women? An analysis of routinely collected UK general practice data. BMJ Open 2013;3:e003320. Contributors LT collected and anonymised all patients’ data while PPDD managed all related ethical approvals; LT and PPDD constructed the final study design after substantive discussions with WD and TVL; MV, KA and WD were responsible for all literature searches and references; data analysis and interpretation were contributed by LT and KA; MV used SPSS V.20.0 to create the figure and Mendeley for reference management; LT, MV and KA contributed more or less equally to the writing. All authors performed a critical review and revision of the final manuscript and gave final approval for submission. LT is the guarantor. Ethics approval Ethical approval for the data analysis was obtained from the Ethics Committee of the Antwerp Hospital Network (10/04/2013, EC Approval Number 4183).